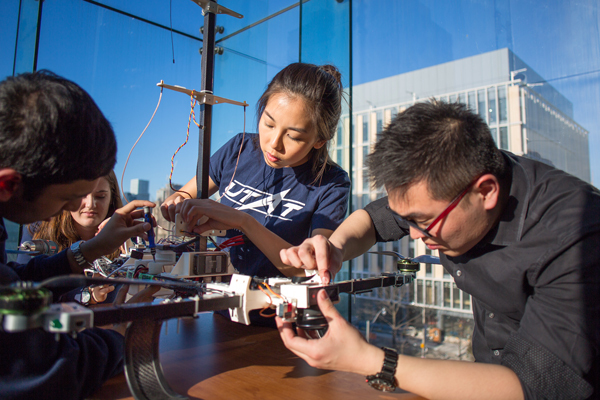 The next generation of engineering leaders require a world-class technical foundation — and rich opportunities to gain practical experience by applying their competencies in context. 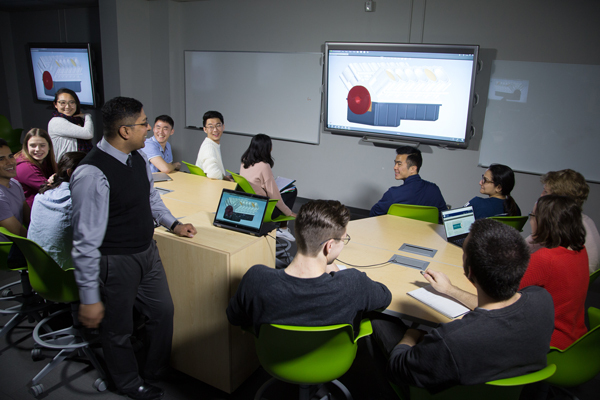 The new Myhal Centre for Engineering Innovation & Entrepreneurship further elevates engineering experiential education by providing a dynamic, flexible environment where students can design, build, test and iterate on new technologies, both inside and outside the classroom. The Myhal Centre doesn’t contain traditional classrooms. Instead, its learning spaces use technology to re-imagine the relationship between the speaker and the audience. They are designed to make every class, guest lecture or special event a forum for two-way engagement and spontaneous interaction. The Lee and Margaret Lau Auditorium, located on the first and second floors of the Myhal Centre features 468 seats arranged around tables in groups of four or six to encourage active learning and collaboration. A data communications system embedded in each table enables the lecturer to display any team’s work onto the stadium-style display array to share their ideas with the entire class. The stage, which is large enough to accommodate a full-sized vehicle, is the perfect place for live demonstrations. The Myhal Centre also contains several technology enhanced active learning (TEAL) rooms, which feature flexible seating that can be quickly re-arranged into different configurations and interactive data displays. The Faculty’s TEAL Fellows program supports professors as they refine their pedagogies to take full advantage of these new facilities. The TEAL rooms and adjoining design studios are ideal for the Faculty’s suite of design-oriented capstone courses. 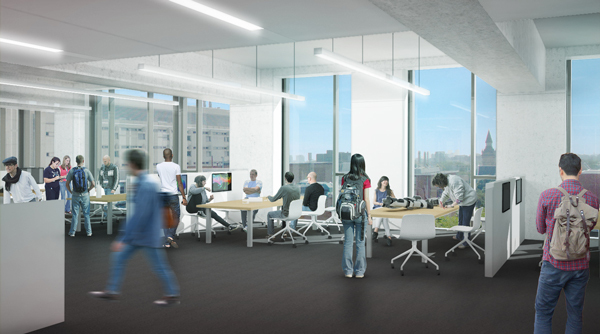 The Institute for Multidisciplinary Design & Innovation (IMDI), which partners with external companies and organizations to facilitate industry-oriented design projects for students, will have dedicated space on the building’s fifth floor. Co-curricular activities provide a crucial opportunity for students to apply their technical competencies while developing complementary abilities in leadership, communication, problem solving and teamwork. 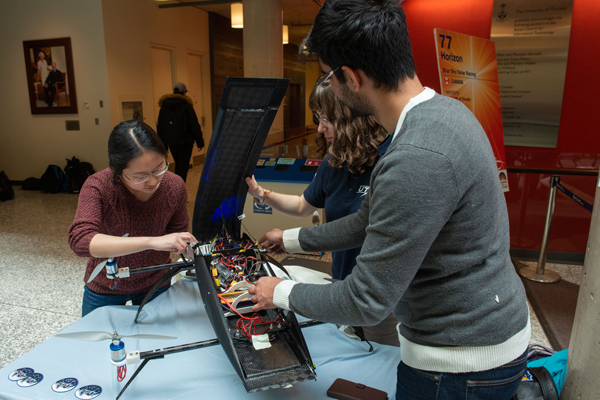 U of T Engineering is home to more than 100 student clubs and design teams — including the Supermileage Team that designs, fabricates and races hyper-fuel-efficient prototype vehicles; the University of Toronto Aerospace Team (UTAT) that builds and flies aircraft, satellites and rockets; and the Human-Powered Vehicle Design team that won the 2017 World Human Powered Speed Challenge. Level 0 of the Myhal Centre contains the Engineering Society Arena. Supported by a $1-million gift from current students, the arena will provide new, permanent homes for several clubs and teams. 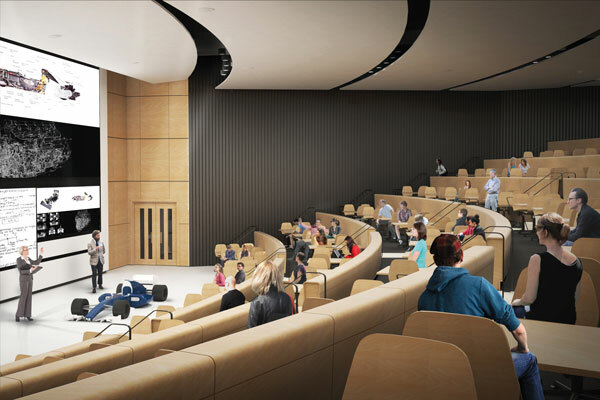 It also contains flexible meet/work spaces, a versatile event space, and a sound-proof, multimedia music room to support the talented Skule™ Music community, which includes an orchestra, a choir and a stage band. 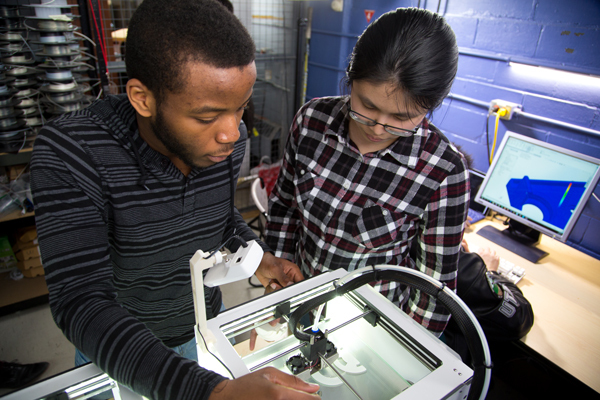 The third floor of the Myhal Centre includes a supervised rapid-prototyping room with powerful multi-material/composite materials 3D printers and other fabrication equipment. This will enable students and faculty members to quickly fabricate parts, models and renderings, watching their ideas literally take shape before their eyes. 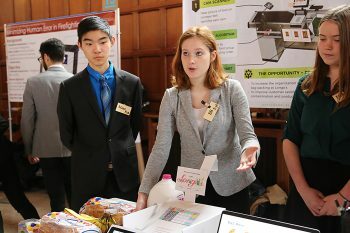 Any founder will attest that launching a startup is an intense and powerful learning experience, and strong support for entrepreneurship enables U of T Engineering students to make the most of this opportunity. 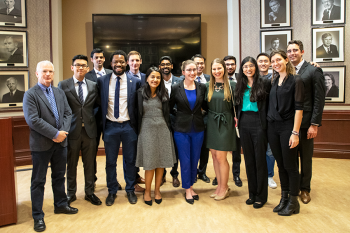 Established in 2012, the Entrepreneurship Hatchery has provided teams of students with space, equipment, mentoring, funding connections and all the other ingredients necessary to incubate new ventures. 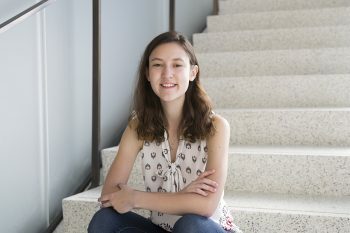 They can choose from one of two streams: Hatchery Nest, which focuses on early stage student-led ventures; and Hatchery LaunchLab, which provides support for graduate student and faculty-led research-based startups. A generous donation from Gerald and Geraldine Heffernan has created a new home for the Hatchery, the Heffernan Hatchery Suite. This dynamic space will provide an ideal environment for Hatchery teams to meet with their mentors and get advice on everything from marketing to how to secure their intellectual property. Teams will also have access to prototyping and fabrication equipment on the lower floors.